The Fontana Dreux Oil Rubbed Bronze Faucet is nothing short of beautiful and functional. The unique architecture and design of this faucet - especially the dark, antique bronze finish - reeks of old fashioned charm and elegance. Although this faucet more so belongs to a contemporary bathroom, the makeup makes it an absolutely perfect addition to a traditional bathroom as well. The Fontana Dreux Oil Rubbed Bronze Faucet comes with dual handles and is capable of producing hot and cold water - perfect for households with varying water temperature needs. Constructed from excellent brass and zinc alloy materials and coming with a 1-year warranty, the Fontana Dreux Oil Rubbed Bronze Faucet is one bathroom fixture that will definitely serve its purpose for a very long time. We have an antique style bathroom and this dark classic faucet fits in just great. It was delivered promptly, although without installation instructions. Luckily everything needed was included in the box and it was easy to put it up. For now it works perfectly, I hope it will keep. I needed a new set of faucets for our client, and when they told me that they wanted something traditional, like Victorian or something, I flipped my tab open and showed them this site. After going over the different faucets here, they decided on this one. I readily agreed that this may indeed be what they were looking for since I've installed this before. Well, I was right. They loved it! Will definitely be using this site more often now. 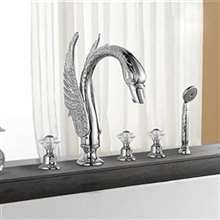 I was on the lookout for a faucet that would fit my clients rather traditional mansion, and I lucky I chanced upon this one. The slim design works well with the bathroom's theme and looks nice overall. It was also good that it came in antique bronze finish which the client loved. We were actually thinking that this will look much better with age.